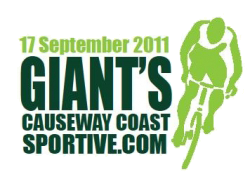 On line entries for the Giant’s Causeway Sportive close tomorrow (14th September) at midnight and as a last minute incentive riders who pre enter can use the discount code GCCS1105 and receive 10% off their entry. On the Day entries are expected to be available during registration times on Saturday 17th September but due to extra administration cost this incurs, the entry fee for all on the day entrants will be £40. The Giant Killer a combination of the Causeway Coaster and the Glens and Coast Route the total distance is just over 180km. Ireland’s top pro tour cyclist Philip Deignan (Radioshack) is also expected to take part, joining the hundreds of keen amateurs as they tackle the first Giant’s Causeway Sportive.